Distance, metaphorical and literal, recurs as a theme, especially in the elegiac, “The Dream of Water” in which an address to the dead becomes a kind of ars poetica. The lines “I see you standing on a far continent// and between us stretches,/ impenetrable darkness” lead to the devastating: “I think the world / must be a hollow longing// filled with more of itself—.” Among the many tools in Johnson’s kit is her ability to use the underlying form of the poem—in this case the stanza break between “far continent” and the next line—to underscore the separation and space between the living and the dead. In some sense, then, choices like this one mirror the frustrations of elegy itself: that the poet longs to speak to (and for) the dead, aware of the fact that this is inherently impossible. In this sense, the poem is that cursed, failed and failing attempt. A similar sense of absence and frustration drives “Letter from the Ice Field, December,” in which “I try to call you inside/ but my mouth locks with frost. // The room of skulls floods with snow./ I have forgotten how you sound.” As throughout, the necessity to memorialize and to remember confronts the impermanence of things: the way memories fade, stories are forgotten. In the face of this decay, then, the poems take on a ritualistic quality. In “Purgatory,” for instance, the hunt—its own kind of ritual—is depicted as joyless, gruesome, endlessly repeating even as it is ultimately unsatisfying. There is a bluntness to the language, a stark and bare verse: “I shoot it, then cut away the meat,/ which I must haul back/ till it rots,/ but never eat.” This is all as “penance/ for a world destroyed,” and later, the butchery turns inward: “Love has been gone/ for some time now. / I have sawed through my own leg/ trying to find the way back.” Elsewhere, this cutting down to the core of things—to the bones—seems to serve as a metaphor for the cyclical and intermingled nature of life and death. 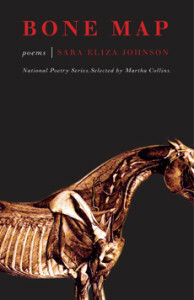 “The Last Przewalski’s Horse” fixates exactly on that boundary: a hunter “Cuts away/ the glistening red web/ of matter around the heart/ and rinses the cavity” before he “plucks each hair/ from the tail for his violin.” The eyes of the horse he discards in a field for “the last flies of the season/ which, a day before the snow/ finally kills them/ consume the retina/ piece by piece, photon/ by photon to see.” Here, Johnson unearths the extent to which death itself can be a creative force: it is nourishment; it brings with it music, though possibly of the sad variety, and clearer, if not comforting vision. “I come from a country near ruin,” the voice tells us in “Archipelago: Ultima Thule,” where “Nothing// is well. Even death’s bones/ have broken so many times.” And yet, through it all, “I will excavate and the artifact,// sift shadows from the shadowless,” The only way to continue, then, and it may not be much, is this process of cataloguing, of processing, of writing. The poem ends with an inversion of lines from a folk ballad: “And I’ll be true to my love/ if my love is not true to me.” This imbalance—the core of the vulnerability inherent in any attempt at love and faith—is tragic, but there is something hopeful in the devotion. This is not trendy poetry; it is not peppered with contemporary references, mentions of celebrities or Brooklyn—as far as I can tell, there is no internet in there; it is not humorous, but it is remarkable, brave. Bone Map manages to bring the reader both intimately close to the subject matter, and far away as if looking from the widest possible angle. This is a collection that ably, successfully creates its own lexicon of loss. Originally of Cleveland, Ohio, Mark Gurarie currently splits time between Brooklyn and Northampton, Massachusetts. He is a graduate of the New School’s MFA program, and his poems and prose have appeared or are forthcoming in Pelt, Paper Darts, Sink Review, Everyday Genius, The Rumpus, Coldfront, Publishers Weekly, Bort! Quarterly, Lyre Lyre and elsewhere. In 2012, the New School published Pop :: Song, the 2011 winner of its Poetry Chapbook Competition. He also co-curates the Mental Marginalia Poetry Reading Series in Brooklyn and blogs about unimportant things at bubblegumandpoppers.wordpress.com.